Locked talons: Myth or reality? The bald eagle, once on Ontario's endangered species list, has its highest concentration of eagles within Ontario in Sunset Country. Bald eagles prefer to live near water where they can readily access food, making Northwest Ontario and its 70,000 lakes and rivers surrounded by Boreal forest, the perfect habitat. This majestic bird holds a special place in many people's hearts - they are a symbol of courage and strength. You might think you know everything there is to know about bald eagles, but I 'll bet there are a few things that would surprise you. Whenever you hear a supposed eagle in a Hollywood movie or cartoon, it’s been dubbed over by the screech of a red-tailed hawk. Eagle calls are quite soft and weak sounding and not considered cool enough for Hollywood. Here’s what an actual eagle sounds like, not what you were expecting, right? Juvenile Bald eagles don’t have white heads and are often mistaken for Golden eagles. For four or five years of their lives before they sexually mature, they have white plumage throughout their brown wings, bellies, and even leg feathers. Eagles live for a very long time, averaging 25-40 years and they’ve been recorded at living longer. Eagles also mate for life, so they can actually grow old together! To impress each other, both males and females court each other by soaring to high altitudes, locking talons and tumble or cartwheel towards the earth! They do this to determine the "fitness" of their mate. I've never seen this "death spiral", but it sure would be amazing to witness. For most birds of prey, females are the largest, much is the same with eagles. Females can weigh 25% more than their male mates. Since both sexes have the same colouration unlike other birds and ducks, a good way to tell them apart is their size. They believe being larger as a female makes it easier for them to protect their young, seeing as they spend the most times incubating eggs, though the males do help. If you’ve spent any time with fishing guides, you’ll be amazed at how quickly they can determine whether that’s an eagle or a turkey vulture soaring above you. The trick is looking at their wings. If they fly in a “V” it’s a vulture, if their wings soar flat, it’s an eagle! 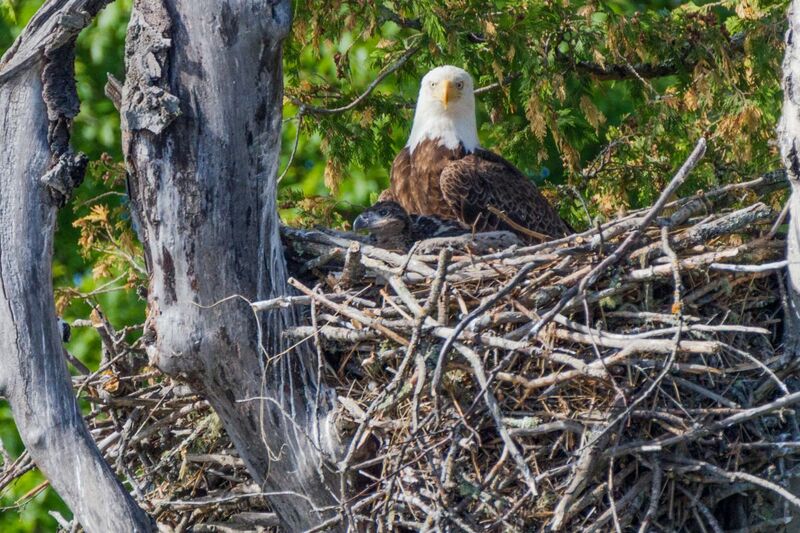 Bald eagles have the largest birds nests. Both sexes build the nest together, and if it serves them well, they’ll renovate it each year. Unlike with humans, nest renovations build their lifelong bond. Sometimes, they’ll add up to 2 ft of added material to their nest year after year. Can you picture a birds nest four feet deep and 5 ft wide? That’s larger than a twin bed. You won’t have to picture them if you visit Sunset Country! Locked talons are a myth. Eagles can let go of fish that are too heavy, they just don’t want to. That’s their meal and they’d rather swim to shore than lose it! Did we mention they are fantastic swimmers? Well, certainly better than you’d imagine. With hollow bones and water repellent-ISH feathers, they can really wade their way back to shore. Eagles field of vision is wider than us humans, just imagine putting a wide angle lens on a camera with perfect focus, and you have yourself “eagle eye” vision. Did we mention they can also see ultra-violet light? It is entirely unique to North America, Canada, U.S. and northern parts of Mexico, while another eagle species, the Golden eagle lives throughout the northern hemisphere. Though their populations are making recovery in the United States, there are plenty of bald eagles in Canada! In the mid-20th century, the bald eagle population declined sharply as a result of the widespread use of DDT. After the ban of this chemical, there was a slow increase in the eagle population. Since the eagles eat mostly fish from the lakes and the lakes were contaminated with DDT, it was a slow progression. Northwest Ontario fared better than Southern Ontario as Lake of the Woods and area lakes were less impacted from the chemicals. While the numbers declined slightly, the population remained relatively healthy. If you're visiting Ontario's Sunset Country, you're bound to see many eagles. 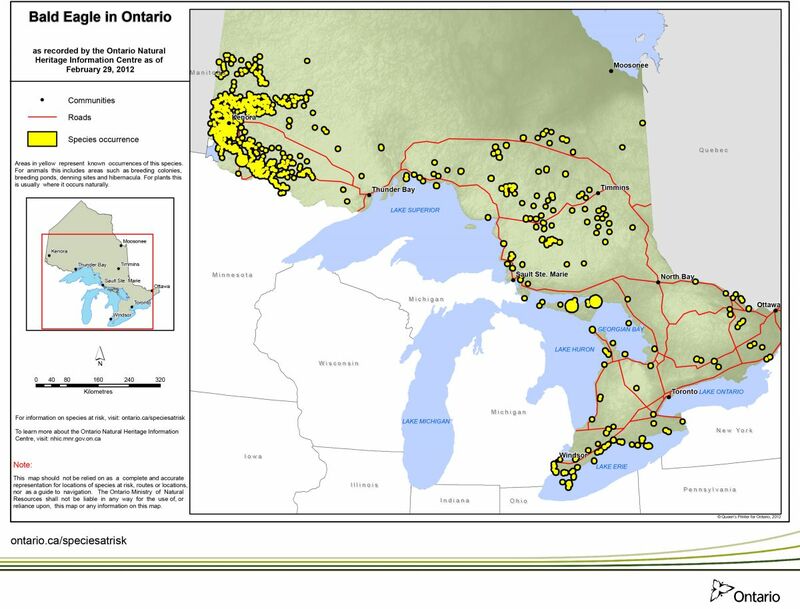 Take a look at the map of Ontario below. You'll see the northwest corner of Ontario has the high concentration of Bald eagles in Ontario. If you're wondering if you'll see any bald eagles on your vacation in Ontario's Sunset Country, the answer is an astounding yes! Many anglers will put out their fish guts out on a rock (away from your cabin) and watch the show. Below is a video of some eagles at one of Kashabowie's Outposts. Can you guess which eagle is the boss? Andrew, a guest at Kashabowie Outposts filmed these bald eagles. 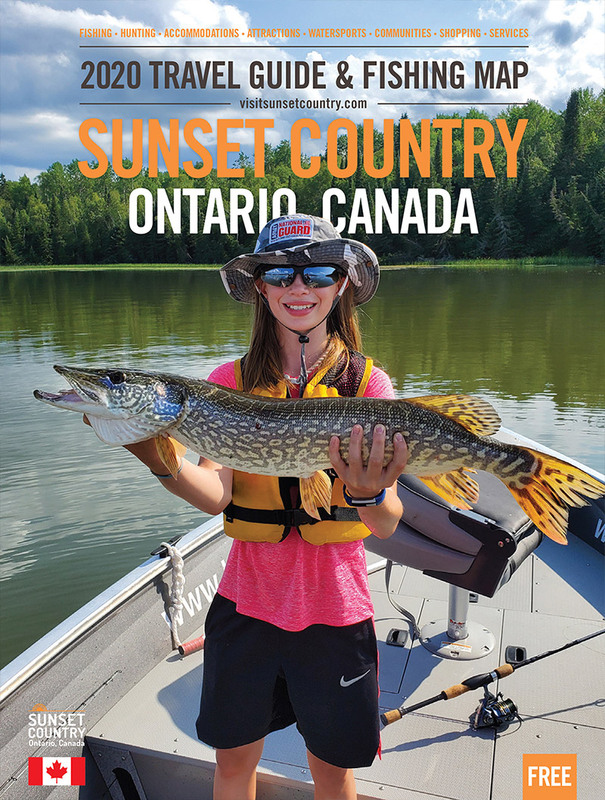 Order to your Ontario's Sunset Country Guide & Map to help plan your next vacation so you too can enjoy seeing all the eagles!